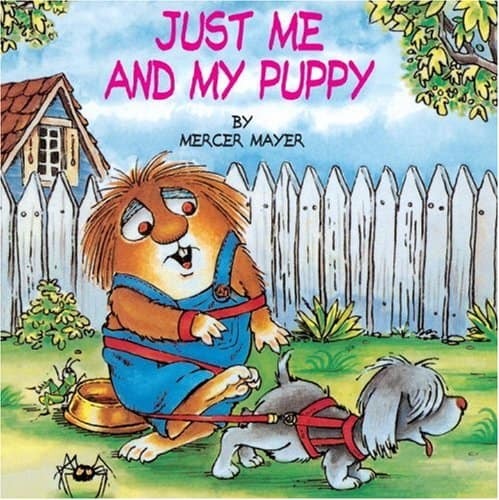 Just Me And My Puppy is worth a close look because, like many others in this long-running series, it is a wonderful example of ‘counterpoint irony’ in picture books. Though the title may annoy purists, the grammar of the title foreshadows a story told from the point of view of a toddler-aged creature. As a child I always wondered what ‘critters’ were. I thought a critter must be some sort of American animal in particular. Apart from ‘counterpoint irony’, another useful concept when considering any disconnect between words and pictures is ‘symmetry’. Nikolajeva and Scott have attempted to create a sophisticated taxonomy of picturebook interactions (between words and pictures) and came up with a sliding scale. Symmetry is at one end, in which the pictures pretty much repeat what the words have already explained. At the other end is ‘contradiction’, in which the pictures say something completely different from the words, often creating irony or humour. The problem with having ‘symmetry’ at the extreme end is that pictures cannot help but say more than the words, since ‘a picture tells a thousand words’ (or thereabouts). So there will never exist a perfectly symmetrical picturebook. 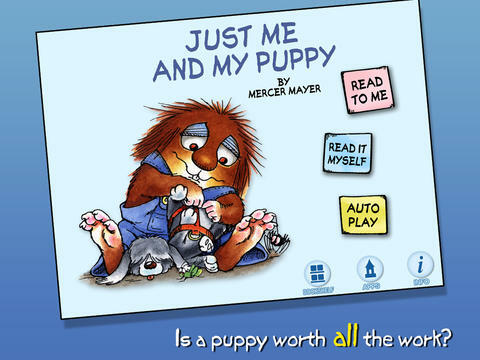 In Just Me And My Puppy, the words tell us a sweet but bland story about a child who is care for and train a new dog. The pictures tell a difference story altogether: the story of a boy who is struggling to control an exuberant and disobedient puppy. Readers familiar with the innocent, willing-to-please Little Critter will see that the puppy is simply a more exaggerated version of the Critter. Broadly speaking, irony is a difference between what was expected and what actually happens. In literature, irony is a rhetorical figure based on a deviation from the dictionary meaning of words. Picturebooks make use of their own specific kinds of irony. Irony cannot be expressed by illustrations alone, but can be achieved when the words in a picturebook don’t match up with the pictures, creating what academics have called an ‘ironic counterpoint’. How does this counterpoint work, exactly? Mayer begins the ironic counterpoint on page two. Page one sets the story up, with the protagonist swapping his baseball mitt for a puppy. The picture does not contradict the words, as we indeed see a box full of puppies and a raccoon pleased with his new baseball mitt. Naturally, there is more to the illustration than there is to the words — we see they are in a basement, that the box of puppies used to hold tomatoes, that a surprised spider is watching on. But this pictorial elaboration is not a counterpoint so much as an expansion. Come page two, we are told, ‘My baby sister liked him right away.’ But we see a puppy jumping all over a baby, who doesn’t look pleased at all. Page three is less ironic: ‘And, boy, were Mom and Dad surprised! They said I could keep him if I took care of him myself.’ The interesting thing is, we now mistrust the little boy’s version of events, and adult co-readers (especially) will be wondering how that conversation really went down. 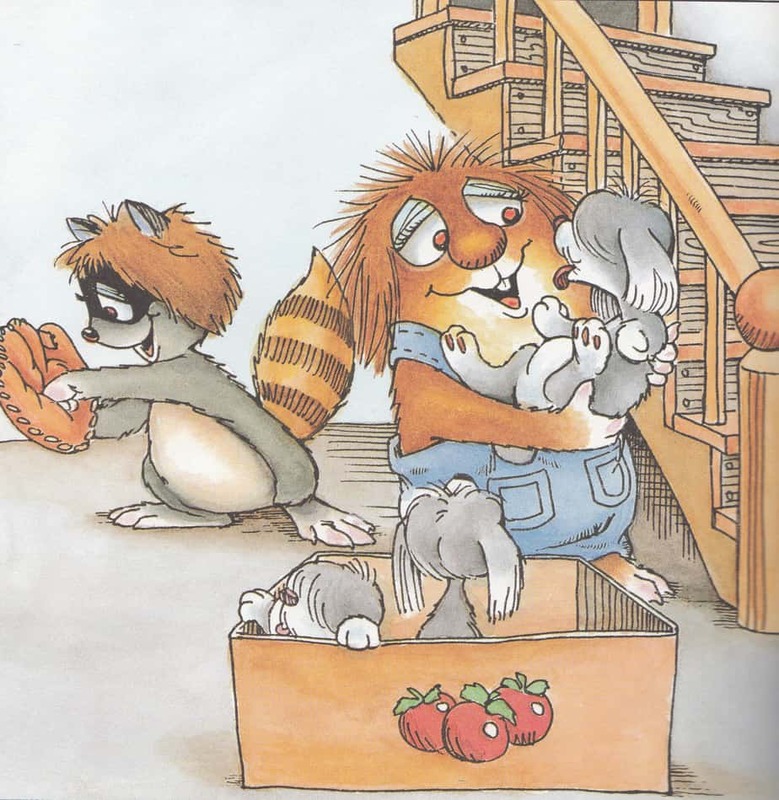 Mayer is very good at depicting facial expressions, and the parents in the Little Critter books manage to so often look resigned, disappointed and skeptical, but loving at the end. The ironic counterpoint heightens as the Little Critter trains his puppy. 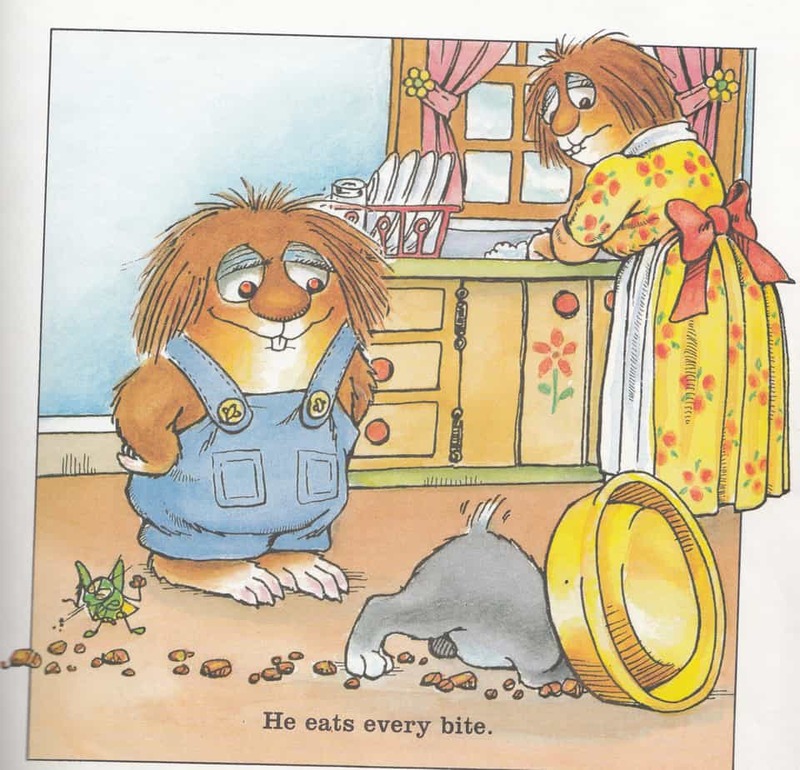 ‘He eats every bite,’ we read, noting that there is dog food spread in a trail right across the kitchen floor. ‘I am teaching my puppy how to heel’ shows Little Critter tangled in dog lead with the puppy pulling uncontrollably, and so on. After a few pages of unsuccessful episodes, we see a full-page spread set in a park. Now we see a ‘snapshot’ scene, of four Little Critters and four puppies, and we take from this that all of these scenes happened, but not at the same time. 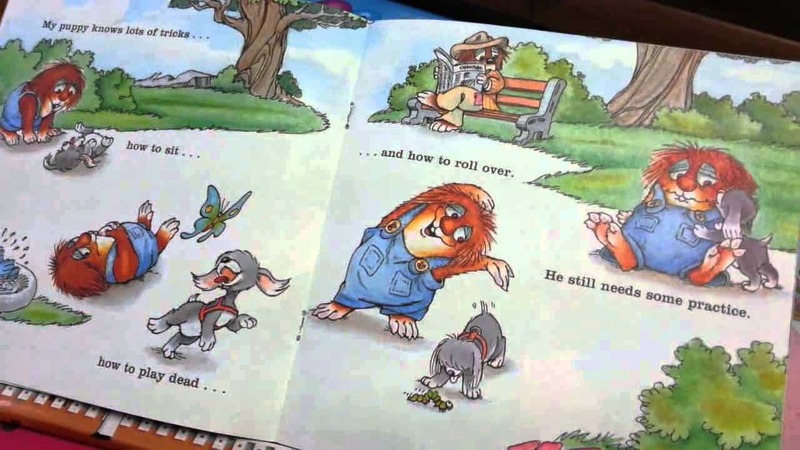 Notice how Little Critter is dotted across the page — the reader is given a clear sequence of events. Sometimes a sequence of events depicted like this is not important — events can happen in any order. Personally, I like my eye to be guided around/across a page. I like to know what’s meant to come first. Notice also the white space across the park scene. The path is the white space. Not only do Little Critter books tell two different stories via the words and the pictures; the pictures contain a subplot story about a spider and a grasshopper who readers will be keen to locate once they realise these unnamed characters are a regular instalment on each page. These characters never speak, but they have facial expressions which offer the reader further emotional cues. Mercer Mayer has a knack for depicting ‘cute’. Especially cute is the scene where Little Critter gives puppy a towel-dry and blow-dry, in which puppy transforms from a bedraggled creature into a fluffy pom-pom. The look on Little Critter’s face is one of great love. The setting of the Little Critter series is an American home housing a middle-class nuclear family somewhere between 1950 and 1970, when groceries came home in paper bags, when mothers stood at the sink washing dishes by hand in one-piece dresses with big bows at the back, when pets were sold from cardboard boxes. This is a cosy setting which only existed in America for a very short time, but it’s surprising how many picturebook creators are still making use of it. The cosiness of it is particularly well-suited to the picturebook audience, who receive much of their reading time right before bed. In conversation with Katie Davis on the Brain Burps About Books Podcast, Mayer expressed his opinion on technology* by saying that he bought a top of the line computer a long time ago (about 1990?) and hasn’t needed to upgrade since. I mention this because those of us illustrating picture books digitally are faced with a tough decision: Make do with cheaper software, or spend a disproportionate amount of money (relative to likely income) on Adobe CC. For those making do with older software on older hardware, Mayer’s opinion that you don’t actually gain much (if anything) by having the latest and greatest is worth hearing once in a while. *While I’m talking about that interview, when Katie Davis asked a question about narrative theory, Mayer said matter-of-factly that he has never understood narrative theory, before throwing the question back to his interviewer. As someone who has also never really understood narrative theory (which gets surprisingly complex once you graduate past ‘three act structure’, it’s soothing to learn that a best-selling author of many, many picture books doesn’t have a handle on it himself. So maybe we younger ones don’t need to worry too much about narrative theory either, focusing intuitively on what works in your own favourite picture books vs the ones that don’t resonate. First published in 1985 in the USA as a Golden Look-Look Book. Oceanhouse Media made book apps out of the Little Critter series for the emergent reader market. The apps offer the functionality of word-highlighting, read-to-me and autoplay. Hotspots in the illustrations allow emergent readers to touch a part of the picture and hear the name of the object. But since these books were not created to be apps, they have not been coded from the ground up; rather, the pictures have been scanned in. There is little in the way of touch interactivity outside the pop-out words.